8th Graders from St. Cecilia School & Academy proudly wearing shirts representing their high schools of choice. Fifty-eight eighth graders graduating from Access’s middle school Academy program have been accepted to 14 area private, college-prep high schools. As graduates from the Academy program, these Access students will receive an estimated $700,000 in high school tuition scholarships cumulatively over a four-year period, additional counseling and resources through the Graduate Support program, and assistance in college preparation and selection from the College & Career Counselor. “We are extremely proud of the hard work of our 8th graders. 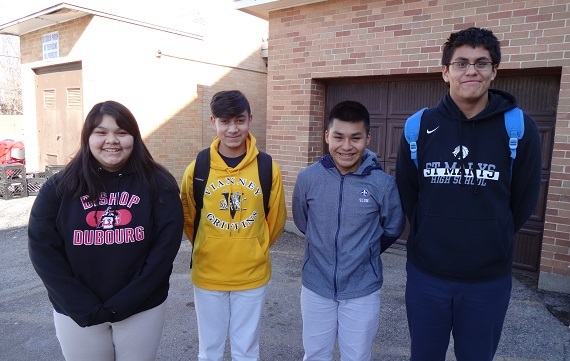 Since sixth grade, they have participated in longer school days and attended summer school programming to earn admittance to their high school of choice,” said Tom Mackowiak, Executive Director. The Academy program extends the school day to provide enrichment programs in the areas of Academic Development; STEM; Leadership, Character, and Health Education; and the Arts. Access also requires middle school students to attend a Summer Learning Academy focused on core subjects. Academies are currently located in Most Holy Trinity Catholic School & Academy (North St. Louis City); St. Cecilia School & Academy (South St. Louis City); Sister Thea Bowman Catholic School (East St. Louis), and St. Louis Catholic Academy (North St. Louis City). After completing the middle school Academy program, Access students enter the Graduate Support program where Graduate Support Directors provide high school guidance counseling, mentoring, and advocacy on behalf of students and their families. Students also receive their high school tuition scholarships and have access to additional financial support through Work-Study programming. Moreover, Access supports post-secondary preparation by funding campus tours, and covering all costs related to ACT preparation and testing, and college applications. “We expanded our mission this year to formally include college and career counseling and are now making a minimum 11-year commitment to every student in our program,” added Mackowiak. Founded in 2005, Access propels at-risk middle school students through high school and on to college and career success with enrichment, counseling, and scholarships. To date, Access has impacted more than 1,200 students living in high-poverty areas in St. Louis. Ninety-nine percent of its graduates have been accepted to private, college-prep high schools; 98 percent graduate on-time; and 96 percent are accepted to colleges, universities, or other post-secondary institutions. For more information regarding this release, please contact Julie Linder, Public Relations for Access, by calling (573) 268-0639 or emailing Julie.Linder@ACCESSacademies.org.